Martin Galvin, then leader of NORAID (Irish Northern Aid Committee), was banned from entering the United Kingdom (UK). The Irish Republican Army (IRA) issued a statement threatening any civilians who worked for the Royal Ulster Constabulary (RUC) or the British Army (BA). The Ulster Freedom Fighters (UFF) exploded seven incendiary devices in shops in the Republic of Ireland. The British government transferred three Republican prisoners involved in a ‘dirty’ protest at Whitemoor Prison in Cambridgeshire to prisons in Northern Ireland. 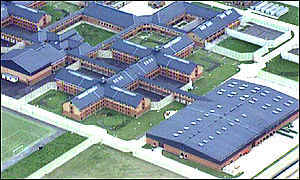 Four other prisoners continued with their protest at Whitemoor. This brought the number of prisoners transferred to Northern Ireland to 21. Patrick Mayhew, then Secretary of State for Northern Ireland, lifted a fund-raising ban on organisations suspected of having paramilitary links. The ban had been imposed 10 years earlier. 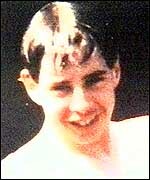 James Coopey (26) from County Down was charged with the murder of James Morgan on 24 July 1997. The Northern Ireland (Sentences) Act became law. The legislation allowed for the early release of paramilitary prisoners. Only prisoners who were members of organisations that were observing ceasefires could benefit from the legislation. Marjorie (Mo) Mowlam, then Secretary of State for Northern Ireland, declared that the Irish Republican Army (IRA), Ulster Defence Association (UDA), and the Ulster Volunteer Force (UVF), were inactive. 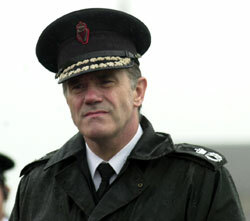 Ronnie Flanagan, then Chief Constable of the Royal Ulster Constabulary (RUC), announced that the Union Flag would not be flown outside RUC stations on public holidays. Flanagan said that this would bring RUC policy on the matter into line with the rest of the United Kingdom (UK). [Some Unionists reacted angrily to the announcement. As part of a government reshuffle of ministerial posts, John McFall replaced Tony Worthington at the Northern Ireland Office (NIO). Marjorie (Mo) Mowlam, then Secretary of State for Northern Ireland, retained her position in a British government reshuffle that left all but one member of Tony Blair’s cabinet in place. Mowlam had earlier briefed journalists that she wanted to stay in post to complete the Good Friday Agreement. Peter Robinson, then deputy leader of the Democratic Unionist Party (DUP), called the decision “a disaster”, however, Nationalists welcomed the development. Relatives of the 14 men shot dead and 13 people wounded by British soldiers in Derry on 30 January 1972 expressed disappointment at an Appeal Court ruling that the soldiers who opened fire would not be named during the proceedings of the Bloody Sunday Inquiry. Died one day after being shot by sniper while sitting in parked car outside Starry Plough Bar, New Lodge Road, Belfast. Found shot in his firm’s van, Carrowreagh Road, Dundonald, Belfast. Shot while walking along Obins Street, Portadown, County Armagh. Died one day after being injured during land mine attack on British Army (BA) / Royal Ulster Constabulary (RUC) foot patrol, Cullyhanna, County Armagh. In the Stormont (Northern Ireland parliament) by-election in the city of Londonderry (Derry) the Ulster Unionists retained the seat. Maureen Moore (21), a Catholic civilian, was shot dead by a Loyalist paramilitary gunman as she stood at the corner of Stratheden Street and Edlingham Street, New Lodge, Belfast. The effect of the strike deepened with the engineering sector of the economy being the hardest hit. The use of intimidation (or ‘persuasion’ as the Loyalist paramilitaries preferred to call it) had a significant impact on the number of people who managed to get to work. The strike began to have a number of effects on the farming sector with uncollected, or unprocessed, milk having to be dumped and fresh food not reaching shops. The Ulster Workers’ Council (UWC) issued a list of ‘essential services’ which were to be allowed to operate as normal and also issued a telephone number for anyone engaged in such work. The UWC also ordered public houses to close. There was an outbreak of sectarian rioting. The strike was the main subject of Northern Ireland ‘question time’ in the House of Commons at Westminster. Paddy Devlin, a then member of the Executive, threatens to resign on the issue of Interment. Merlyn Rees, then Secretary of State, met with Loyalist leaders in Stormont. Mr Rees said that he would not negotiate with the UWC. Two Protestant civilians were shot dead by Republican paramilitaries outside a Social Club, Alliance Road, Belfast. An off-duty Royal Ulster Constabulary (RUC) officer was shot dead by the Irish Republican Army (IRA) near Benburb, County Tyrone. 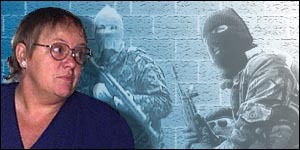 The Irish National Liberation Army (INLA) announced that they had kidnapped the wife of ‘supergrass’ Harry Kirkpatrick. Gerry Adams, then President of Sinn Féin (SF), spoke at a seminar in Amsterdam, Holland. Adams criticised the Anglo-Irish Agreement (AIA) saying that it secured the partition of the six counties of Northern Ireland. Malcolm Moss, then Northern Ireland Office (NIO) minister, shook hands with Mitchel McLaughlin, then Sinn Féin (SF) chairman, when the minister opened a shopping centre in Creggan Estate, Derry. John Major, then British Prime Minister, was reported in an Irish Times (a Dublin based newspaper) article as having said that arms decommissioning would have to be addressed at the start of talks. Tony Blair, then British Prime Minister, travelled to Belfast to deliver an important speech on Northern Ireland. Blair reaffirmed his government’s commitment to the Framework Document, the Mitchell Report on decommissioning and the ground rules for entry into all-party talks. Blair also said that he valued Northern Ireland’s place in the United Kingdom (UK) and suggested that the Republic of Ireland should amend Articles 2 and 3 of its constitution. The Prime Minister also said that government officials would meet with representatives of Sinn Féin (SF) in order to allow a number of issues to be clarified. Ronnie Flanagan, then Chief Constable of the Royal Ulster Constabulary (RUC), said that all those Loyalist paramilitary organisations represented by the Combined Loyalist Military Command (CLMC) had broken their ceasefire since it was declared in October 1994. Security forces defused a car bomb, estimated at 500 pounds, which had been left outside the Royal Ulster Constabulary (RUC) station in Armagh. The bomb was discovered at 11.15pm and the area cleared before a warning was received at 11.30pm. Larry O’Toole, then a prominent member of Sinn Féin, was shot and injured during a First Holy Communion church service for local children in Ballymun, Dublin. OToole’s son, Lar, was also shot by the gunman who was chased out of the church and later caught by a number of the pursuers. There was a rally held in Lurgan, County Armagh, in support of the ‘No’ campaign. At the rally a message was read out from James Molyneaux, former leader of the Ulster Unionist Party (UUP), who said that he would be voting against the Good Friday Agreement. Members of Justice for the Forgotten, the campaign group representing families of those killed in the Dublin and Monaghan bombings on 17 May 1974, held a wreath-laying ceremony in Dublin. The group called for a full public inquiry into the bombings. Around 800 residents from the Garvaghy Road area of Portadown, County Armagh, held a meeting at which Brendán Mac Cionnaith, then spokesperson of the Garvaghy Road Residents’ Coalition and independent councillor in Portadown, rejected rumours that a deal had been done to resolve the disputed Drumcree parade. Died two months after being shot from passing car, Grosvenor Road, Belfast. Shot by sniper while standing on corner of Stratheden Street and Edlingham Street, New Lodge, Belfast. Shot while standing outside Social Club, Alliance Road, Belfast. Off duty. Shot outside his home, Derryfubble, near Benburb, County Tyrone. Shot at his home, Abbeydale Parade, off Crumlin Road, Belfast. Off duty. Shot outside his home, Linkview Park, Malone, Belfast. Killed by booby trap bomb attached to British Army (BA) van, outside British Army (BA) recruiting office, Harrow Road, Wembley, London. A Protestant man was shot and killed by Loyalists in Belfast. Two members of the Official Irish Republican Army (OIRA) were killed in a premature bomb explosion. Ian Paisley and Desmond Boal launched the Ulster Democratic Unionist Party (DUP). Five people died in separate incidents in Belfast. A sixth person died later as a result of injuries received on the day. An inquest held in Gibraltar decided that the Special Air Service (SAS) soldiers who shot dead three Irish Republican Army (IRA) members on 6 March 1988 had acted lawfully. There was conflicting evidence on whether or not the IRA members had been given a warning before being shot. ‘Joy riders’ Shot Dead Martin Peake (17) and Karen Reilly (18), both Catholic civilians, were shot dead by British Army paratroopers in Belfast. The two teenagers were travelling (‘joy riding’) in a stolen car. At the time it was claimed that the stolen car had failed to stop at an army check point and struck a member of the army foot patrol. The Democratic Unionist Party (DUP) returned to the resumed political talks (later known as the Brooke / Mayhew talks) at Stormont. The DUP attended this section of the talks because the main business was Articles 2 and 3 of the Irish Constitution. Format of Negotiations Agreed at Talks The parties involved in the talks at Stormont agreed the format for the substantive negotiations. The talks would take place in three strands. The first strand would deal with arrangements for government in Northern Ireland, the second would look at relationships between Northern Ireland and the Republic of Ireland, and the third would look at the relationships between Britain and Ireland. The substantive talks were due to begin on 7 October 1997. Marjorie (Mo) Mowlam, then Secretary of State for Northern Ireland, addressed the Labour Party’s annual conference and announced that internment would be removed form the statute books. William Hague, then leader of the Conservative Party, paid his first official visit to Northern Ireland but did not meet any political leaders. Ronnie Flanagan, then Chief Constable of the Royal Ulster Constabulary (RUC), announced that a number of British Army installations and check-points were to be demolished. There was a further series of releases under the terms of the Good Friday Agreement. Seamus Mallon, then deputy leader of the Social Democratic and Labour Party (SDLP), addressed a meeting of the of the Labour Party conference in Blackpool, England. Mallon, while acknowledging that there was no pre-condition to Sinn Féin’s (SF) entry into an Executive, nevertheless called on the Irish Republican Army (IRA) to make a confidence building gesture. Gerry Adams, then President of Sinn Féin (SF), also addressed the meeting and stated that the row over decommissioning had the potential to wreck the Good Friday Agreement. The Director of Public Prosecutions (DPP) decided not to charge any Royal Ulster Constabulary (RUC) officer in connection with the killing of Robert Hamill following a beating he received on 29 April 1997. 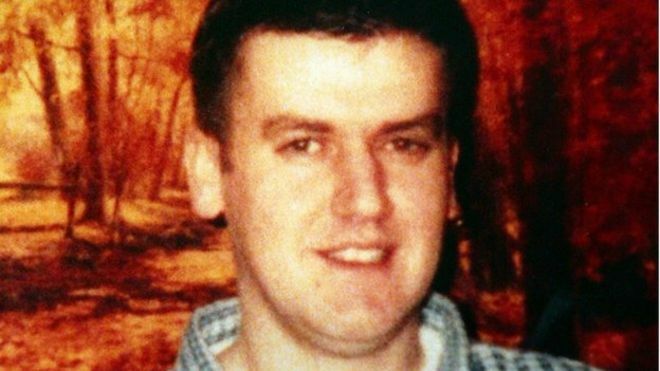 Hamill was severely beaten in a sectarian attack by a gang of up to 30 loyalists in the centre of Portadown, County Armagh, and he died from head injuries on 8 May 1997. Royal Ulster Constabulary (RUC) officers were present close to the scene of the attack and were accused by witnesses and Hamill’s family of not intervening to save him. Ian Paisley, then leader of the Democratic Unionist Party (DUP), travelled to Dublin for a meeting at his request with Bertie Ahern, then Taoiseach (Irish Prime Minister). Shot at his home, Wilton Street, Shankill, Belfast. Shot during attempted attack on British Army (BA) foot patrol, Ross Street, Lower Falls, Belfast. Found shot on waste ground, Glencairn Road, Glencairn, Belfast. Died three days after being shot during altercation between local people and British Army (BA) patrol, Tullagh Park, Andersonstown, Belfast. Shot by sniper while on British Army (BA) foot patrol, Ladbrooke Drive, Ardoyne, Belfast. Killed in car bomb attack outside Conlon’s Bar, Smithfield, Belfast. Injured in car bomb attack outside Conlon’s Bar, Smithfield, Belfast. He died 17 October 1972. Went missing from the Beechmount area, Belfast, during August/September 1972. Presumed killed. Body never found. Shot at his workplace, bakery, Orby Road, Bloomfield, Belfast. Shot at his home, Elimgrove Street, off Cliftonville Road, Belfast. Mistaken for a Catholic neighbour. Shot by undercover British Army (BA) member, Ballygoney Road, near Coagh, County Tyrone. Shot at his workplace, ambulance depot, Royal Victoria Hospital, Falls Road, Belfast. Shot at his workplace, Rosetta petrol station, Ormeau Road, Belfast. Shot while travelling in stolen car, Glen Road, Andersonstown, Belfast. Shot while in friend’s home, Annadale Flats, Ballynafeigh, Belfast. Robert Hamill was an Irish Catholic civilian who was beaten to death by a loyalist mob in Portadown, County Armagh, Northern Ireland. Hamill and his friends were attacked on 27 April 1997 on the town’s main street. It has been claimed that the local Royal Ulster Constabulary (RUC), parked a short distance away, did nothing to stop the attack. 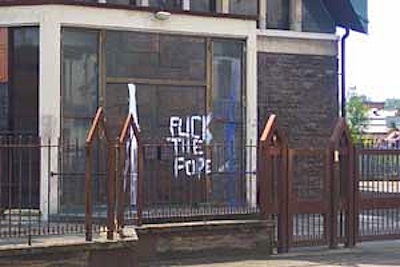 At the time of the murder, tension between loyalists (mainly Protestants) and Irish nationalists (mainly Catholics) was high, mostly due to the ongoing Drumcree parade dispute. Hamill and his friends were attacked by a group of loyalists while walking home from St. Patrick’s dance hall at about 1.30 a.m on 27 April 1997. After walking along Market Street from the dance hall, they came to the intersection of Market and Thomas Streets in Portadown, where they were attacked. Hamill and his friend, Gregory Girvan, were kicked by the crowd while their attackers shouted abuse at them and Robert Hamill was knocked unconscious almost immediately. Girvan’s wife and sister, Joanne and Siobhán Garvin, respectively, called for help from four RUC officers sitting in a Land Rover about twenty feet away from the attack, but they did not intervene to stop the attack. The assault lasted about ten minutes, leaving both men unconscious. Just before the ambulance arrived, one of the RUC men got out of the Land Rover and told Garvin to put Robert into the recovery position. Robert Hamill never regained consciousness and died of his injuries eleven days later on 8 May 1997, aged 25. The cause of his death was recorded as “Diffuse Brain Injury associated with Fracture of Skull due to Blows to the Head”. Six people were arrested after Robert Hamill’s death, but only one was eventually tried for his murder. Paul R. Hobson was charged with murder, but found not guilty, though he was found guilty of unlawful fighting and causing an affray and sentenced to four years’ imprisonment. The case under which Hobson was prosecuted is questionable as the main witness, Constable Atkinson of the then RUC, was at one stage a suspect in conspiracy to cause murder in the same case. His solicitor also did not use crucial evidence in the case to cross-examine witnesses. Mr. Justice McCollum said during his verdict that the killing was a sectarian act, with a very large number of loyalists attacking a small number of nationalists, but that he could not decide whether the RUC men had left their Land Rover or not during the attack. 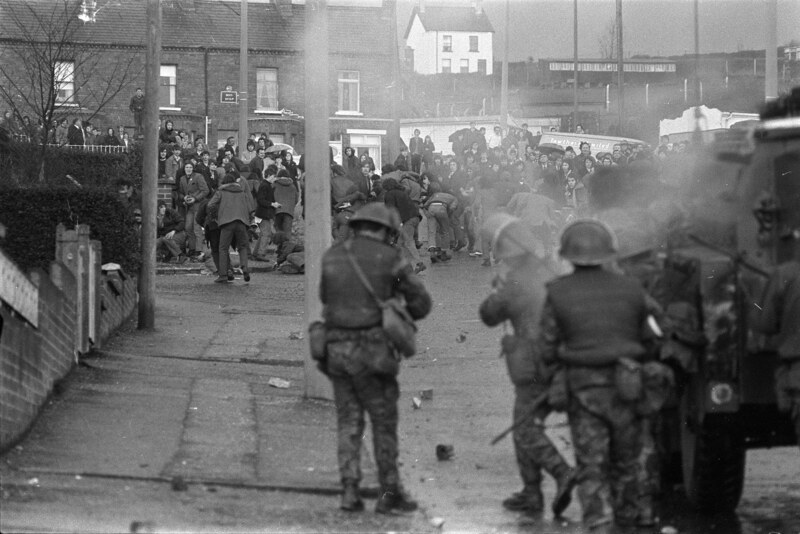 The RUC have been criticised for initially claiming in press releases that there was a riot between two large groups; then afterwards claiming it was a large group attacking a group of four. Rosemary Nelson was solicitor for the Hamill family until she was assassinated by a loyalist car bomb in Lurgan. There have been allegations of collusion between the RUC and suspects. A public inquiry is currently being held on the recommendation of Cory Collusion Inquiry. Tripartite talks continued at Chequers, England. James Callaghan, then British Prime Minister, and Jack Lynch, then Taoiseach (Irish Prime Minister), held a meeting in Downing Street, London. One of the main issues discussed was economic cross-border co-operation. Joshua Eilberg, then a Democrat Congressman, and Hamilton Fish, then a Republican Congressman, paid a five day visit to Northern Ireland. The two men later argued that the United States of America (USA) should play a part in finding a political settlement in the region. Unionist politicians rejected a suggestion by the Ulster Defence Association (UDA) for a boycott of government. William Elliott (31), a member of Red Hand Commando (RHC), was shot dead by members of his own Loyalist paramilitary group, while leaving a friends’ house, Primacy Park, Bangor, County Down. Martin McGuinness, then Vice-President of Sinn Féin (SF), held a meeting with Michael Ancram, then Political Development Minister at the Northern Ireland Office (NIO). The meeting was held at the request of SF to discuss the political situation; there was agreement to meet again. Loyalist who were taking part in the weekly picket of the Catholic church at Harryville, Ballymena, said that they would extend the protest to include Catholic chapels at Ballycastle, Dervcock, and Lisburn. They said that they would continue their protest until the Orange Order was allowed to parade in the Catholic village of Dunloy, County Antrim. In continuing sectarian tension in the Oldpark area of north Belfast, the homes of three Catholic families were attacked with petrol bombs. There were no serious injuries in the attacks. David Trimble, then leader of the Ulster Unionist Party (UUP), criticised loyalist paramilitaries for attacks on Catholics. He also called on people to repudiate “mafia loyalism” in Protestant areas. Trimble quoted figures indicating that Loyalist paramilitaries were responsible for 9 murders, 76 shootings, 178 ‘punishment’ beatings, and over 400 incidents of forced exclusions. The Progressive Unionist Party (PUP) and the Ulster Democratic Party (UDP) criticised Trimble for his remarks. Loyalists Kill Journalist Martin O’Hagan (51), a Catholic civilian, who worked as a journalist for the Sunday World (a Dublin based newspaper) was shot dead at 10.45pm (22.45BST) by Loyalist paramilitaries as he walked towards his home with his wife in Lurgan, County Armagh. The Red Hand Defenders (RHD), a cover name previously used by the Ulster Defence Association (UDA) and the Loyalist Volunteer Force (LVF), claimed responsibility for the killing. O’Hagan was the first journalist to be killed during the course of ‘the Troubles’. Ronnie Flanagan, then Chief Constable of the RUC, made a further appeal to political and community leaders to do all they can to try to bring an end to the on-going violence in north Belfast. He again stated his belief that Loyalist paramilitaries, in particular the Ulster Defence Association (UDA), were involved in the shooting and rioting. 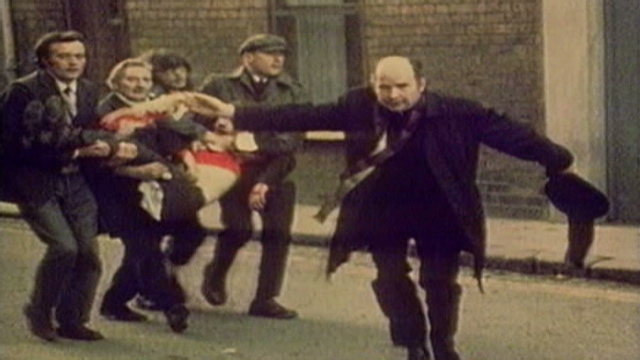 John Reid, then Secretary of State, stopped short of officially declaring that the UDA ceasefire was over. In a statement Reid said the he would give the UDA one last opportunity to end the violence in north Belfast. [Reid had warned the UDA on 31 July 2001 that he was keeping that organisation’s ceasefire under review.] A concrete block was thrown at a school bus in north Belfast. Seven children were injured in the incident. The bus was taking children, aged 12 to 16 years, to Hazelwood Integrated College when it was attacked at Skegoniel Avenue. Shot at his home, Glenvarlock Street, Belfast. Civilian searcher. Shot during sniper attack on British Army (BA) patrol, Waterloo Place, Derry. Killed in rocket attack on Royal Ulster Constabulary (RUC) mobile patrol, Glen Road, Andersonstown, Belfast. Shot during attempted robbery at Mallusk Post Office, near Belfast, County Antrim. Shot outside his shop, St James Road, Falls, Belfast. Shot, while leaving friends house, Primacy Park, Bangor, County Down. Internal Red Hand Commando (RHC) dispute. 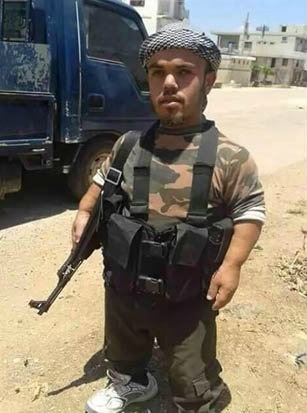 Journalist. Shot while walking near to his home, Westfield Gardens, off Tandragee Road, Lurgan, County Armagh. Demonstrations were held in Belfast by Loyalists and Republicans in support of prisoners who were protesting about parole and food. 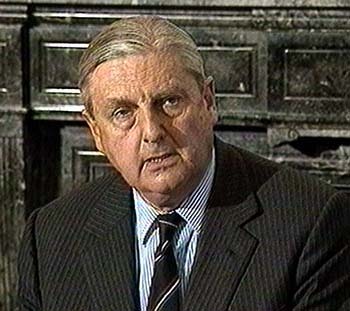 Roy Mason, then Secretary of State for Northern Ireland, marked the end of his first year in the region by stating that ‘the myth of British withdrawal from Northern Ireland’ was now dead. 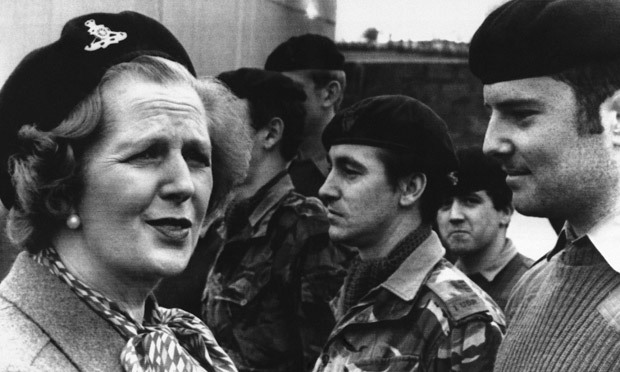 Margaret Thatcher, then British Prime Minister, paid a visit to Northern Ireland and described the Ulster Defence Regiment (UDR) as a group of “very, very, very brave men”. In Dublin Sinn Féin (SF) announced the launch of the Irish National Congress. A confidential discussion paper was leaked from the political talks (later known as the Brooke / Mayhew talks). It was claimed that the paper had been prepared by Patrick Mayhew, then Secretary of State for Northern Ireland, in an attempt to overcome a perceived lack of channels of communication between Northern Ireland and the Republic of Ireland. Patrick Mayhew, then Secretary of State for Northern Ireland, gave a speech to the British Irish Association. Mayhew called for flexibility on the part of the political parties. The Democratic Unionist Party (DUP) published a policy document entitled ‘Breaking the Log-Jam’. The Ulster Volunteer Force (UVF) planted a 1.5kg bomb on the Belfast to Dublin train. Only the detonator exploded and two people were injured. on 20 September 1992. Patrick Mayhew, then Secretary of State for Northern Ireland, held his first formal talks with representatives of the Ulster Democratic Party (UDP) and representatives of the Progressive Unionist Party (PUP). David Trimble, then leader of the Ulster Unionist Party (UUP), said he would not attend the Forum for Peace and Reconciliation in Dublin. Trimble held a meeting with Peter Robinson, then deputy leader of the Democratic Unionist Party (DUP), and Robert McCartney, then leader of the United Kingdom Unionist Party (UKUP), to discuss proposals for Unionist unity. Mary Robinson, then President of the Republic of Ireland, had a number of engagements in Belfast. There were protests at one of the venues, a women’s centre on the Donegal Road, and the centre was later badly damaged in an arson attack. Michael Whelan (35), a Catholic man, was discovered beaten to death in the lower Ormeau area of Belfast. The Royal Ulster Constabulary (RUC) later said the motive for the killing was sectarian. Tony Blair, then British Prime Minister, issued a statement calling on David Trimble, then leader of the Ulster Unionist Party (UUP), to remain in the multi-party talks at Stormont. Mary Robinson formally resigned as President of the Republic of Ireland. She took up a new position as High Commissioner for Human Rights at the United Nations. Ronnie Flanagan, then Chief Constable of the Royal Ulster Constabulary (RUC), speaking on ‘Sunday With Adam Boulton’ on Sky News, said the threat from dissident Republicans was growing. Groups such as the ‘real IRA’ were regrouping and posed a threat, especially in border areas, he said. There was a sectarian attack by loyalists on the home of Danny O’Connor, then Social Democratic and Labour Party (SDLP) MLA. A group of loyalists had gathered outside his home shouting threats and causing damage to his car. It was the third sectarian attack on his home in three months. British army bomb disposal experts defused a pipe-bomb thrown through the window of a house in the upper Shankill on Sunday night. The house on the Ballygomartin Road was unoccupied when the device and a petrol bomb were thrown through the living room window at around 11.00pm. A pipe-bomb was thrown at the home of a Loyalist politician during an outbreak of violence on the Loyalist Shankill Road area of Belfast. 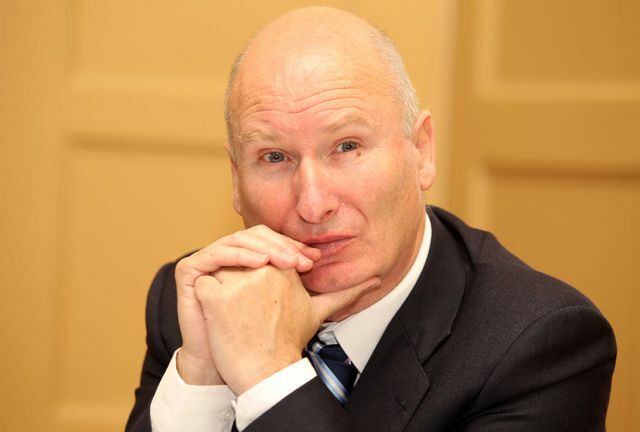 Billy Hutchinson, Progressive Unionist Party (PUP) Assemblyman, was at the scene of the attack when a device was thrown at his home in the Shankill area. Hutchinson’s wife and father-in-law had to be moved from the house and other nearby homes were evacuated. There was a bomb attack at 12.30am (0030BST) on an Royal Ulster Constabulary (RUC) patrol in Derry. Three RUC officers were investigating a burning car at a building site when a bomb exploded at the side of the road. The officers were treated for shock. The Loyalist protest at the Holy Cross Girls’ Primary School followed the pattern of Monday and Tuesday. However, before going to the school the children and parents held a a prayer service and a minute’s silence for the victims of the terrorist attacks in the United States of America (USA) on 11 September 2001. Richard Haass, then a United States special envoy, had a series of meetings with political leaders in Northern Ireland. Bertie Ahern, then Taoiseach (Irish Prime Minister), announced that Friday would be a national day of mourning for the victims of the terrorist attacks in the USA. 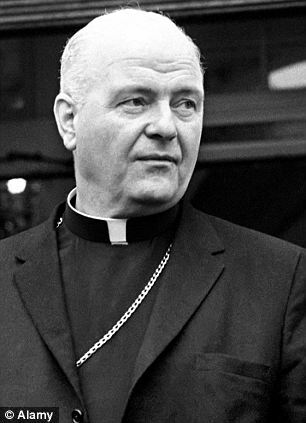 Ronnie Flanagan, then Chief Constable of the Royal Ulster Constabulary (RUC), announced that the target of 50:50 recruitment of Catholics and Protestants to the new Police Service of Northern Ireland (PSNI) was being achieved. New policing legislation following recommendations in the Patten Report had laid down 50:50 recruitment rule. During the first phase of the application process 8000 people had applied for jobs of whom 550 were deemed qualified and a minimum of 260, possibly as many as 300, would be offered places on the trainee program. Shot at his home, Milltown Avenue, Derriaghy, near Belfast. Shot at his home, Springfield Road, Belfast. Off duty. Shot while walking along Hall Street, Maghera, County Derry. Killed by booby trap bomb, attached to his Ulster Defence Regiment (UDR) member father’s car outside their home, Clonmakane Court, Caw, Derry. Three British soldiers were killed in a land mine attack near Dungannon, County Tyrone. There were two bomb attacks at train stations in London; the attacks were carried out by the Irish Republican Army (IRA). 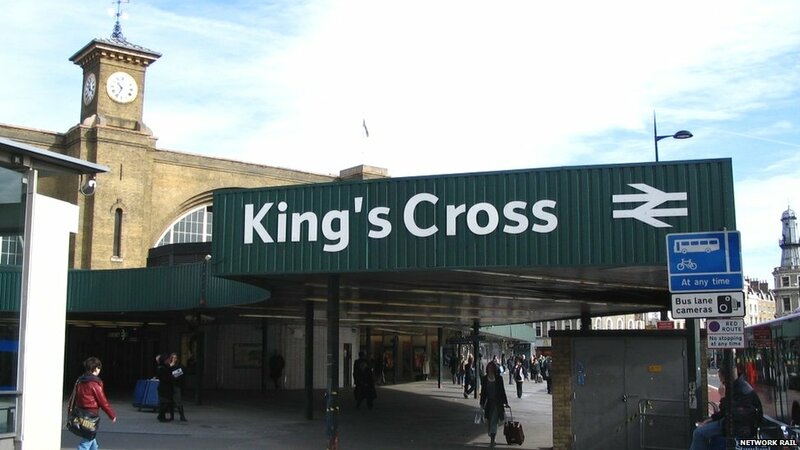 At 1.00pm a small bomb exploded at King’s Cross Railway Station, London. At 1.05pm the Press Association received a phone call warning of a bomb at Euston Railway Station. At 1.15pm another small bomb (estimated at 2-5 pounds of explosives) exploded outside the Rail Bar at Euston Station, London. There were no deaths but 12 people were injured in the blast. Douglas Hurd replaced James Prior as Secretary of State for Northern Ireland. Rhodes Boyson became the Minister of State at the Northern Ireland Office (NIO). There was a ministerial reshuffle at the Northern Ireland Office (NIO). Nicholas Scott was promoted to Minster of State and Deputy Secretary of State while Peter Viggers replaced Rhodes Boyson at Economic Development. Three Royal Ulster Constabulary (RUC) detectives who had been involved in the original ‘UDR [Ulster Defence Regiment] Four’ case were themselves sent for trial. There were disturbances involving Gaelic Athletic Association (GAA) supporters and Orange Order members at a parade in the village of Dunloy, County Antrim. Four Royal Ulster Constabulary (RUC) officers and several civilians were injured during the clashes. The two governments, British and Irish, decided that the Progressive Unionist Party (PUP) and the Ulster Democratic Party (UDP) were not in breach of the ‘Mitchell Principles’ and therefore could remain in the talks at Stormont. Mary McAleese, then a Pro-Vice Chancellor at Queen’s University of Belfast, announced that she would enter the contest to become the Fianna Fáil (FF) nomination for President of Ireland. Meeting Between Trimble and Adams David Trimble, then First Minister designate and leader of the Ulster Unionist Party (UUP), held his first face-to-face meeting with Gerry Adams, then President of Sinn Féin (SF). The meeting took place in private at Stormont, Belfast. Both men later described the meeting as cordial and businesslike. Adams said: “He is a man I can do business with” but repeated his position that he could not deliver on decommissioning. Ronnie Flanagan, then Chief Constable of the Royal Ulster Constabulary (RUC), announced that British army patrols in Belfast would cease from the weekend because of the reduced threat from paramilitaries. There was a pipe-bomb attack on a house in the Woodburn estate, Carrickfergus, County Antrim. The attack took place in the early hours of Monday morning when the device exploded in the living room of the dwelling. There were no injuries but there was some damage to the property. British Army bomb disposal officers had to defuse a pipe-bomb that had been left in a public house in Portstewart, County Derry. The device had been left in the pub the previous day by Loyalist paramilitaries. 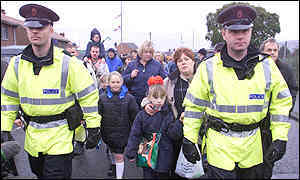 The first part of the protest by Loyalists at the Holy Cross Girls’ Primary School passed off quietly as Catholic children and parents made their way into the school along a security cordon. However, as the parents returned from the school the protest turned noisy and more abusive. Protesters used air horns (klaxons), blew whistles, and banged metal bin lids, as the Catholic parents made their way back down the Ardoyne Road. Some of the Loyalist protesters shouted “Fenian scum” at the parents. [This was day 6 of the most recent protest.] Richard Haass, then a United States special envoy, held a meeting with John Reid, then Secretary of State for Northern Ireland, in London about the current political situation in Northern Ireland. The two men also discussed the protest at the Holy Cross Girls’ Primary School in north Belfast. Gerry Kelly, then a senior member of Sinn Féin (SF), introduced a private members’ motion in the Northern Ireland Assembly proposing that the “Assembly supports the right to education of children attending the Holy Cross Primary School in north Belfast”. Unionist members proposed an ammendment to the motion to make it apply to all schools in the area. The amended motion was passed by the Assembly. Killed in land mine attack on British Army (BA) Armoured Personnel Carrier, Sanaghanroe, near Dungannon, County Tyrone. Died two days after being injured by booby trap bomb attached to his car, outside his home, Coast Road, Larne, County Antrim. Died two days after being badly beaten by group of men near his home, Moyard Park, Ballymurphy, Belfast. Found shot by the side of the road, Flagstaff, near Killeen, County Armagh. Alleged informer. Shot at his home, Donegall Road, Village, Belfast. (UDA). Stephen Geddis (10) a Catholic boy died two days after being hit by a rubber bullet fired by a British soldier. An off-duty member of the Ulster Defence Regiment (UDR) was shot dead by the Irish Republican Army (IRA) near Whitecross, County Armagh. The Irish Republican Army (IRA) planted a time bomb in High Holborn, London. No one was injured in the explosion. Jimmy Carter, then President of the USA, gave a keynote speech on Northern Ireland. In the speech he said that the American government would support any initiative that led to a form of government in Northern Ireland which had the support of both sections of the community. In particular the support would take the form of trying to create additional jobs in the region. He also called on Americans not to provide financial and other support for groups using violence in Northern Ireland. James Molyneaux, then leader of the Ulster Unionist Party (UUP), and Ian Paisley, then leader of the Democratic Unionist Party (DUP), attended a meeting at Downing Street, London, with Margaret Thatcher, then British Prime Minister. The two Unionist leaders had asked for the meeting to protest at the continuing Anglo-Irish talks between the two governments. Gerry Adams, then President of Sinn Féin (SF), said that his party would consider constructively any proposals which addressed the decommissioning of paramilitary weapons. However, Martin McGuinness, then Vice-President of SF, ruled out the possibility of the Irish Republican Army (IRA) decommissioning any weapons as a way of overcoming the deadlock in the peace process. Following a series of interviews the Police Authority of Northern Ireland announced that Ronnie Flanagan was to be appointed as the new Royal Ulster Constabulary (RUC) Chief Constable. Ronnie Flanagan took over from Hugh Annesley in November 1996. The New Barnsley Royal Ulster Constabulary (RUC) police station in west Belfast was attacked by a crowd of people who threw petrol bombs and set a lookout post on fire. The RUC responded by firing plastic baton rounds. The Royal Black Preceptory cancelled or rerouted planned parades in Strabane and Pomeroy, County Tyrone, and Bellaghy, County Derry. The LVF announced that it intended to engage in a second handover of weapons following an earlier initiative on 18 December 1998. A man was shot and wounded during a gun attack at Bellavale Terrace, Coalisland, County Tyrone. He managed to drive off before being taken to Dungannon Royal Ulster Constabulary (RUC) station where he received initial treatment for his wounds. He was later taken on to Craigavon hospital. The Royal Ulster Constabulary (RUC) stated that Loyalist paramilitaries had carried out 129 pipe-bomb attacks so far this year. Of these 53 had exploded and 89 were defused. Mitchel McLaughlin, then Sinn Féin Chairman, accused John Reid, then Secretary of State, of turning a blind eye to ongoing Loyalist attacks. The Northern Ireland Housing Executive (NIHE) published its Annual Report which marked the 30th anniversary since it was established in 1971. The report showed that a total of 22,000 people were on the public sector housing waiting list and of these 10,366 were classified as being in urgent need. According to the report there were 44,000 dwellings unfit for human habitation in Northern Ireland. Died 12 days after being injured in bomb attack on British Army (BA) foot patrol, Cupar Street, Belfast. Killed attempting to defuse bomb at Tullyhomman Post Office, near Pettigoe, County Fermanagh. Died two days after being hit by plastic bullet, Divis Flats, Belfast. Off duty. Shot while driving away from friend’s farm, Ballymoyer, near Whitecross, County Armagh. Off duty. Shot outside his home, Ballyronan, County Derry. Shot by undercover British Army (BA) members, while approaching abandoned lorry, Drumnakilly, near Carrickmore, County Tyrone. Shot at her home, Fortwilliam Park, Mount Vernon, Belfast.